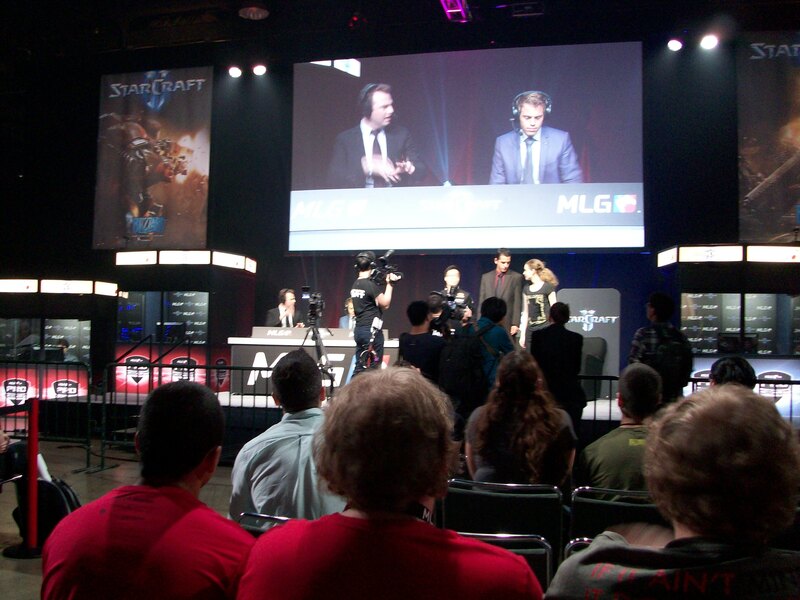 In June I attended MLG Anaheim (Major League Gaming) and Vidcon, which will be covered in a separate blog post. On previous trips to the USA I learnt that taxis are expensive and that there is hardly any free parking in L.A. Since I would be at the convention center for most of the duration of the trip anyway, I opted not to get a rental car. Thus, I ended up booking with supershuttle to transport me from the airport to my hotel and back (18$ per ride). Without planning this, I ended up meeting up with some people from the Day gatherings (see my blog posts from May 2013 and March 2014). First, I ran into Jeff at Starbucks. His brother Andy managed to snag a competitor pass for Starcraft 2. The spots in that competition were filled up with up and coming talents as well as a lot of the professional players, who did not qualify directly for MLG. Later on I saw that Chris “Kobayshi Maru” Negrin posted on twitter that he and his friend Mark were heading to MLG as well. I saved some seats and we did get to hang out and catch up throughout the weekend. At some point early on I found the Misscliks people: I also write articles for Misscliks.com, which focusses on the achievements of women rolemodels in geek culture and gaming. However, so far I hadn’t met any of them and had only interacted online. To the side of the group, I saw Geoff “iNcontroL” Robinson and Stephanie “Missharvey” Harvey. Since they were having a conversation, I did not want to interrupt. Still, I positioned myself next to them, in order to introduce myself once there was a lull in the conversation. This is where Anna Prosser Robinson impressed me: apparently she recognized me from my tiny profile picture and greeted me by name. She proceeded to introduce me to everyone there, the aforementioned iNcontroL, Missharvey, Stephanie Powell and Neil Sharum. In the evening I met the rest of the group, Neal “Koibu” Erickson and Geneviève “Livinpink” Forget, as well as some other cool e-sports people like Jaycie “Gillyweed” Gluck, Matt Wiltshire, Michael Young and Matt Marcou. Since I was there for leisure and not work I opted to watch some Starcraft (II). Perhaps Blizzard should consider enabling an offline mode. It’s an old game now, there is no need to worry about piracy. I bring this up, because when the internet at the venue gave out, all the other games like Call of Duty and Super Smash Brothers Melee continued, but due to the always online “feature” of Starcraft, its matches were interrupted. On the bright side, it gave everyone the chance to check out the other games. To me, one of the big surprises of the event was the popularity of Smash Brothers. 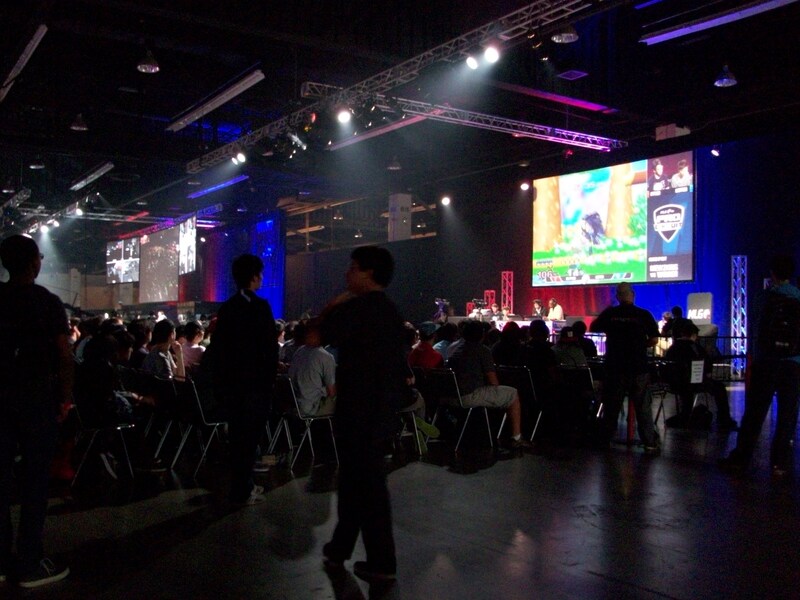 It was entertaining to watch and the Smash fans cheered even louder than the Starcraft crowd. My brother is making fun of me for being very selective about my time whenever I am in London. The thing is that I know several dozen people in London and I couldn’t even manage to meet up with everybody, if I am there on a weekend. Thus, when I am there, I plan out different time slots, which I then assign to people. Often times, I also prioritize, leaving the Friday and Saturday night slots for good friends, whereas I’d meet up for lunch with people I am less close with. There are exceptions, of course – people I see on every trip won’t be disappointed, if it only works out for lunch every once in a while. This time I was on the receiving end of this, as a friend of mine was extremely busy and had to juggle around his breakfast, lunch and dinner meetings. Due to scheduling conflicts, I ended up meeting my friend, who is also one of my Alpha readers, for breakfast to talk about game design, magic the gathering and the discoveries I made, while revising Age of Torridan. Back at the venue, the Starcraft matches were pretty crazy – the best moment was when Scarlett switched from Zerg to Protoss for a game and received standing ovations. I loved the atmosphere and the spectators’ energy. Earlier on I had used up all of my credit on my pay as you go phone. I had one more code to charge another 15 Euros, so I decided I would only use my phone in an emergency. However, when Scarlett switched to Protoss that counted as an emergency, so I enabled roaming to post on twitter about it. The highlight of the trip proved to be the after party at Matt Wiltshire’s and Michael Young’s hotel room. They nailed the important ingredients for any party and I ended up leaving at 7 a.m. when we were down to six people. Even though I was the only person above thirty, I did not feel out of place – everyone was just so friendly and awesome. Thanks for making me feel welcome, I had an absolutely terrific time! Hopefully MLG Anaheim and Vidcon will be on consecutive weekends next year as well, as I would love to attend them both again. 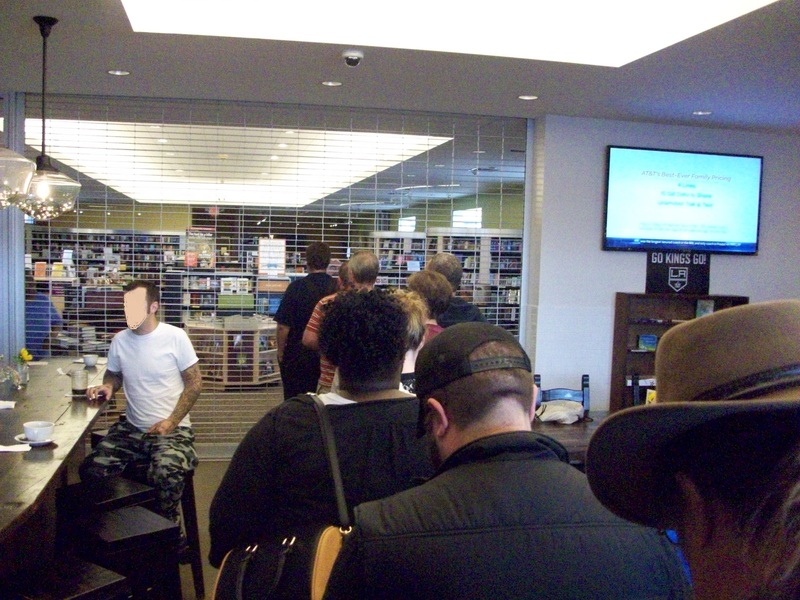 Today I went to the launch event of Jim Butcher‘s latest book “Skin Game”, which was held at Mysterious Galaxy in Redondo Beach. I arrived early in the morning, so that I could get a low number for the signing, but several other people had the same idea. Still, I managed to snag number fourteen, which wasn’t too bad, considering how many people ended up being there in the evening. Someone asked about another short story collection in the spirit of “side jobs” and Jim mentioned that there would indeed be another one called “brief cases” once he collects enough material. 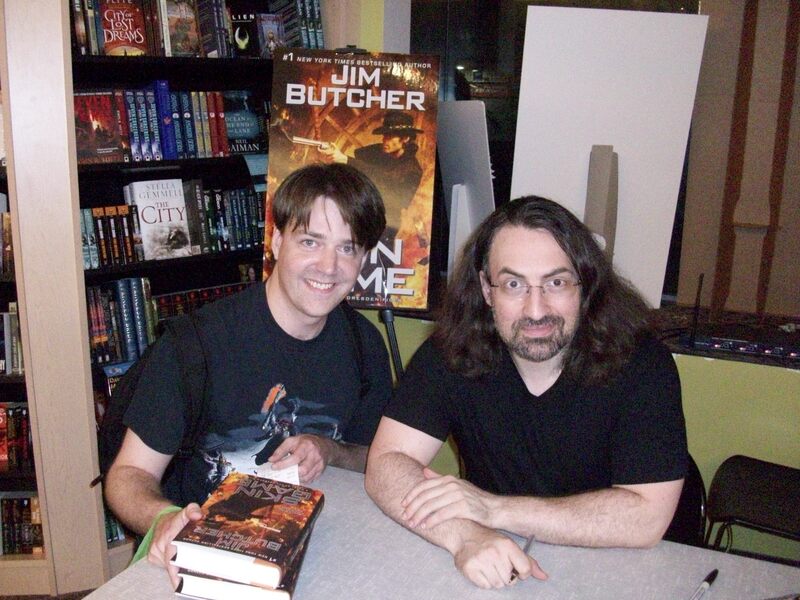 There is an option for a new TV show with the additional point that if it ever gets the green light, Jim Butcher will probably be involved as a consultant / executive producer. In general he lightened the mood with jokes throughout. I didn’t even ask questions this time, but someone else brought up beta readers, so he said that in case of his books it’s more of a “beta asylum”, because a regular reader can just turn the page and find out what happens next when there is a scene that makes one turn over the table in frustration. The beta readers on the flipside might have to wait a long time for that next page to get sent to them. Another good question was about recommendations regarding up and coming authors that didn’t get as much exposition so far. At that, he threw out the name Benedict Jacka. When it was time for the signing, I said “I flew in all the way from Europe to see you.” but unlike my trip to the UK to attend the Patrick Rothfuss signing, this time it wasn’t the complete truth. I actually flew to Las Vegas to see Lindsey Stirling, so I did confess that I was exaggerating, but that I did get a rental car and drove from Vegas to L.A. for his book launch. I got an extra book for Day and mentioned that he plugged Jim Butcher’s books several times on his show and also in his “Why we like it” series, which surprisingly only has about twenty thousand views. I’m very much looking forward to reading “Skin Game”. As expected, the highlight of this vacation was the Lindsey Stirling concert at the House of Blues in Las Vegas. This was her tenth concert of forty six of her North America 2014 tour. Before I arrived in Vegas, I spent half a week in London, catching up with old friends. It’s also more convenient as there is a direct flight from Heathrow to Las Vegas, whereas I would have needed to change planes, if I had gone from Düsseldorf. On the plane, there were two wedding groups and one stag night group. I sat next to one of the guys from the stag night group, who in turn sat next to one of the women getting married in Vegas. Here I thought those weddings were only valid in Nevada, but I guess I was wrong. Anyway, they asked me why I would be flying to Las Vegas, so I showed them Lindsey Stirling’s video Crystallize and told them that I’m going to her concert. Just like last time when I saw her at her Cologne gig, her sister Brooke Passey took the photos during the meet and greet segment. I had to ask Drew whether it was her, since she used to have blonde hair back then. In the photo above, I explained that I also write for the misscliks.com website that focuses on positive achievements of women in geek culture and gaming. Despite practice, I botched my pitch a bit, but fortunately I was able to fall back on the letter I wrote in advance. 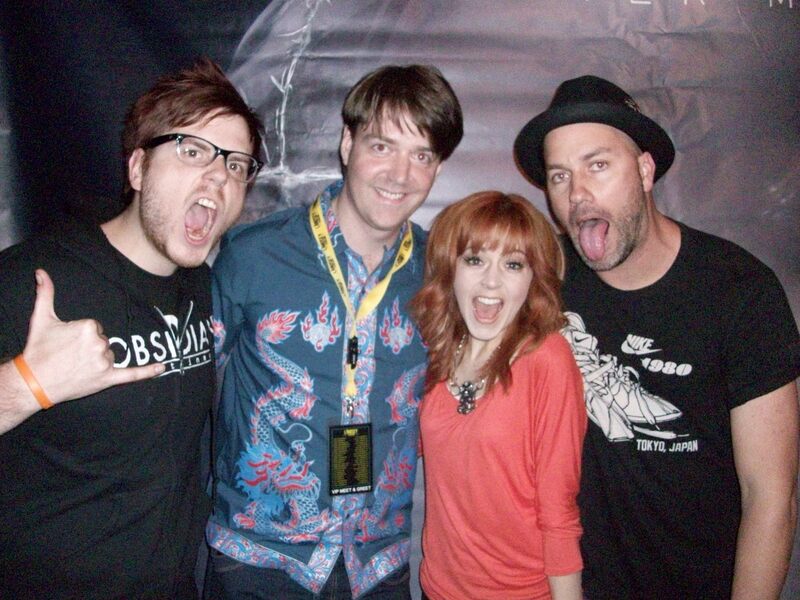 When I got the picture with Drew, Lindsey and Gavi, I didn’t know they were making weird faces, but then again, I probably would have just smiled anyway. When I went to get a coke at the bar, the guy, who stood in line behind me, was there as well. After another bit of small talk, we headed to the stage where we ended up talking to a few of the other meet and greet attendees. His name was Justin and there were Brett and Elizabeth and another girl, but I forgot to introduce myself. Justin raised a good point that it’s hard to find someone, who creates original songs for the violin, rather than just performing classics, which is one of the reasons he likes Lindsey Stirling. During the meet and greet segment, I did manage to ask a question this time: “I was pleasently surpised to find such a strong track like ‘eclipse’ in the bonus material and that made me wonder, what factors govern whether a song is put on the regular track list or on the bonus material?” I’m hitting some points with my questions, for example I haven’t heard that particular question before and it shows that I listened to the CD including the bonus tracks, but on the flipside the question lacked a bit on the emotional impact. Thus, the answer was short – it’s simply a matter of preferance, so the songs that she likes best get regular slots on the CD. Brett actually recorded the whole Q&A segment on his phone, so I asked him whether he could e-mail that to me. During the Q&A it became apparent that our position wasn’t the best, as the instruments blocked out the view. Brett joked about it that he strategically positioned himself in front of the drums, so he could catch one of the drum sticks. However, he actually did catch one in the end! Before her segment, the band Archis performed. 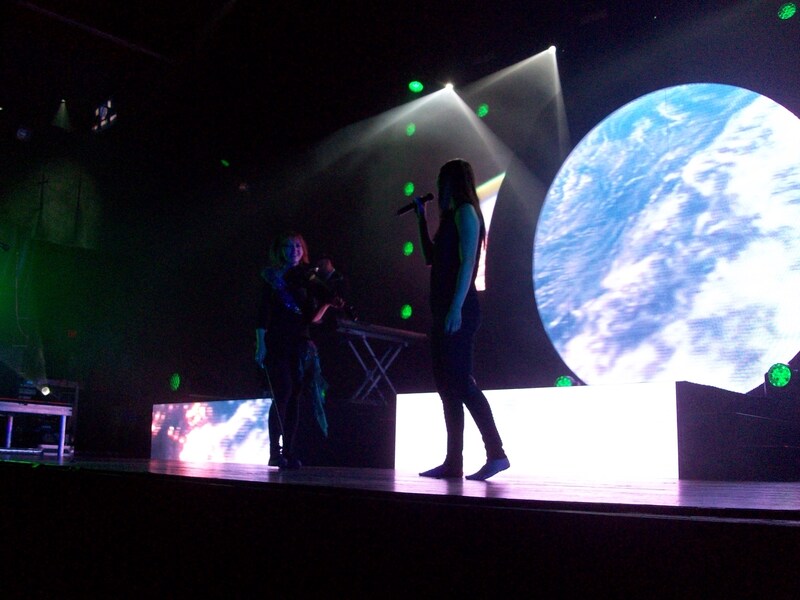 Their lead singer Dia Frampton also joined later on for her collaboration song “We are Giants” with Lindsey Stirling. While performing on Youtube’s Dance Showdown, Lindsey met the dancer Anze Skrube. He planned the choreography for her video of “Stars Align”, which happened to be Justin’s favourite LS song, and also for her tour. 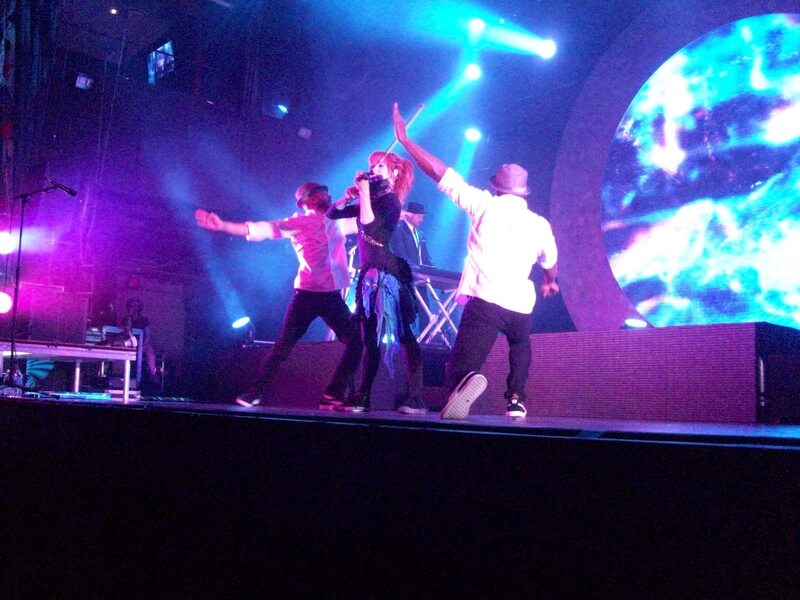 So for most of the songs, Lindsey was accompanied by two dancers Stev-o and Pete. The music is already fantastic, but coordinating all those moves really lifts the performance to a whole new level. Lindsey played a good portion – or maybe even all of it? – of her new album, as well as hits from her first CD, like “Crystallize”, “Moontrance” and “Stars Align”. 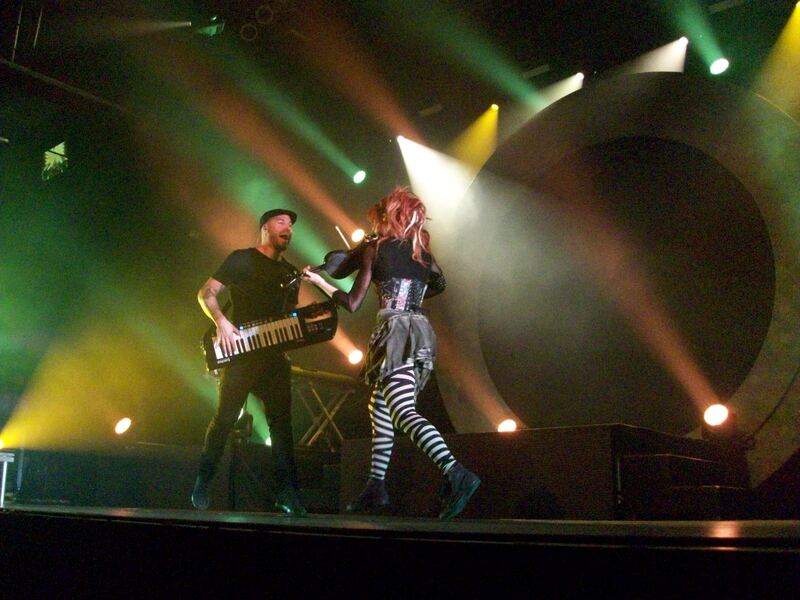 Towards the end of the show, Gavi switched to a portable keyboard. Despite my blurry on stage photos due to the lack of light, I managed to get a good shot of them having fun. 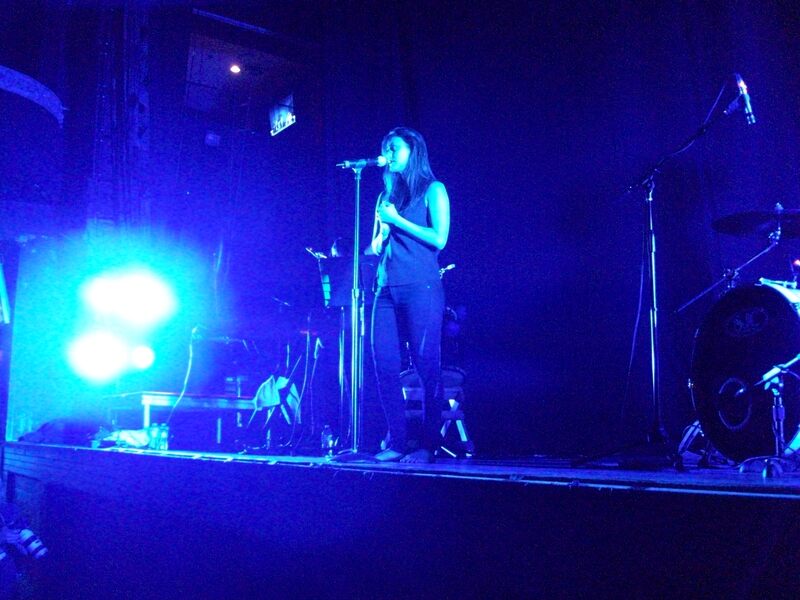 It was an amazing show that is even better than her 2013 tour. If you can, do check out one of her concerts (the dates can be found on her homepage). I’m definitely looking forward to her return to Cologne this October. Here is my review for Brandon Sanderson‘s “The Way of Kings”. I’ll start with the genre and my rating of the book, followed by a synopsis, explaining what the book is about. Since this will be done from memory after I’ve read the book, it may not be entirely accurate. The rating will be as follows: 5 / 5 is reserved for those awesome books that completely blow me away. Think “The Name of the Wind” by Patrick Rothfuss or Brandon Sanderson’s Mistborn series. 4 / 5 are great books that are worth reading. Most likely this will be the majority of book reviews, as I probably won’t spend the time to write up reviews of mediocre books. Still, for completeness sake, 3 / 5 are good books, 2 / 5 are books I would not read, if I were able to go back in time and warn myself about them and 1 / 5 books are the ones that are so aggravating as to incite anger. After this subjective rating, I’ll talk a bit more about the book in the actual review and list what I thought was great about it. This will contain spoilers! Synopsis: A fractured nation of ten provincial rulers is entangled in a drawn out war against a tribe of warriors. At the forefront, this war is about revenge, but it’s equally about securing the plains’ resources in the form of the coveted gem hearts. Two of the three main view point characters are involved in this war effort, but there is a third view point character and some minor view point characters that illuminate the political intrigue and mysterious dealings that will probably become more important as the series progresses. As with all Sanderson books there are several different types of magic in the world, which use the series title giving stormlight as fuel. Review (without spoilers): My friend Peter mentioned that he did not like Sanderson’s Mistborn books, but loved “The Way of Kings”. He’s a huge fan of epic fantasy books like Steven Erikson’s “Gardens of the Moon” or Tolkien’s “Lord of the Rings.” Unfortunately I don’t share that fondness, so for most of the book, I was tempted to give it a 3.5 rating. Epic fantasy just isn’t my cup of tea. The rules of story telling become mere guidelines in works of such magnitude. For example, new authors are cautioned not to have two characters, whose names start with the same letter. In “The Way of Kings” every letter is used for multiple names, which becomes a necessity by sheer number of characters. There’s Kaladin, Kalak, Karm, Kadash, Jasnah, Jezrien, Janala, Dabbid, Dunny, Dalinar and Danlan to name a few. Brandon Sanderson even goes a step farther and wrote a scene where Dalinar and Danlan are interacting. Of course when you’re a brilliant storyteller like Brandon Sanderson you can get away with deliberately breaking the rules, but for a reader, who doesn’t love epic fantasy, this is a bit tedious. However, the last 10% of the novel were so good that I upped my rating to 4. The thing with epic fantasy is that you seem to get 90% build up and 10% payoff. The ratio is much more favourable in regular fantasy, but trust me: that final bit is worth it. Sanderson has cast his hooks throughout the story and when he finally pulled, I couldn’t help but be moved. If you love the genre it’s a must read and even if you don’t, it’s still great and worth your time (but do read the Mistborn books first, if you haven’t done so). As usual, the story is self contained, while leaving enough unresolved points of conflict to keep reader’s wondering how the story will continue in the next book (what happend to Gaz, by the way?). The big ending with Kaladin, despite being burned time and time again, running back to save Dalinar’s men provided a strong emotional pull. Tugging the reader like that is a truly masterful display of skill. It saved the book for me and made me admire Sanderson’s writing even more. P.S. : There are five alternate chapters of “The Way of Kings” in the Altered Perceptions anthology. It’s only available as part of an Indiegogo campaign to raise money for the medical bills of author Robison Wells. It’s late, but I figured I’ll write about it anyway, before all the details fade away. This blog post is about my USA trip in March 2014 that I mentioned in the previous blog entry. I arrived in Los Angeles, after more than 10 hours on a plane. I did not manage to sleep during the flight. Instead, I watched the following five movies: Escape Plan (IMDB score 6.8), which was an 80s style Schwarzenegger and Stallone action movie, despite being from 2013. I’d say it was decent, but the best scene was Schwarzenegger’s typical move, where he grabbed a stationary machine gun, carried it under his arm and mowed down hordes of attackers. The next movie was Ender’s Game (IMDB score 6.9). Strange enough, they sorted it in the “family” category, even though it was pretty dark. Unfortunately the writing excuses guys already spoiled the ending for me, otherwise I might have ranked it higher. Next up in my ranking was Thor the Dark World (IMDB score 7.3) and then the Wolverine (IMDB score 6.8). The latter is a dip down when it comes to the IMDB score, but I liked it best out of the four. I did not want to gamble on the last movie, so I re-watched Lost in Translation (IMDB score 7.8), which is still great on the second viewing. After this movie marathon, I felt pretty knackered, but I wanted to stay awake for as long as possible in order to beat the jet lag. Following a slightly modified tip I read on Daniel Negreanu’s twitter account, I also tried to reset my food clock in addition to the sleep clock. Negreanu phrased it as “Don’t eat x hours before you plan to go to bed in your new time zone”, but I changed it to eat according to the local time, even if you are not hungry. Basically it is the same advice that holds true for sleeping: you just follow the habits of the new time zone, even if it means over eating on the first day. The guy at the rental car place looked like the actor Jeffrey Tambor from arrested development. Since I was alone on this trip and didn’t have someone to look at maps during the drive, I also rented a GPS. When I complained that the rubber suction pad to fix it to the windscreen was missing, the guy told me: “It is forbidden by California law.” Instead, the GPS was affixed to a sandbag, which was put on the dashboard. Weird. 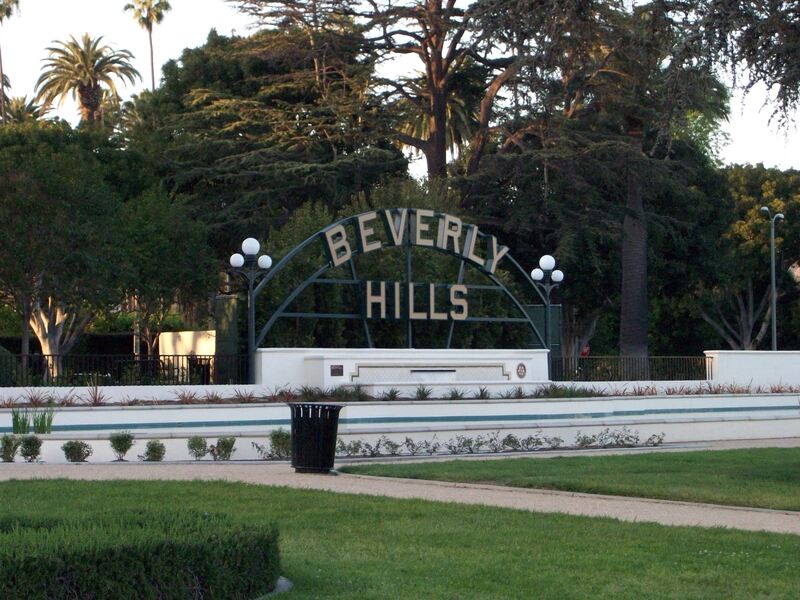 I walked around Beverly Hills and was shocked to see that there were a lot of vacant shops for rent. I guess with all the commerce shifting online, it should not have surprised me that much. 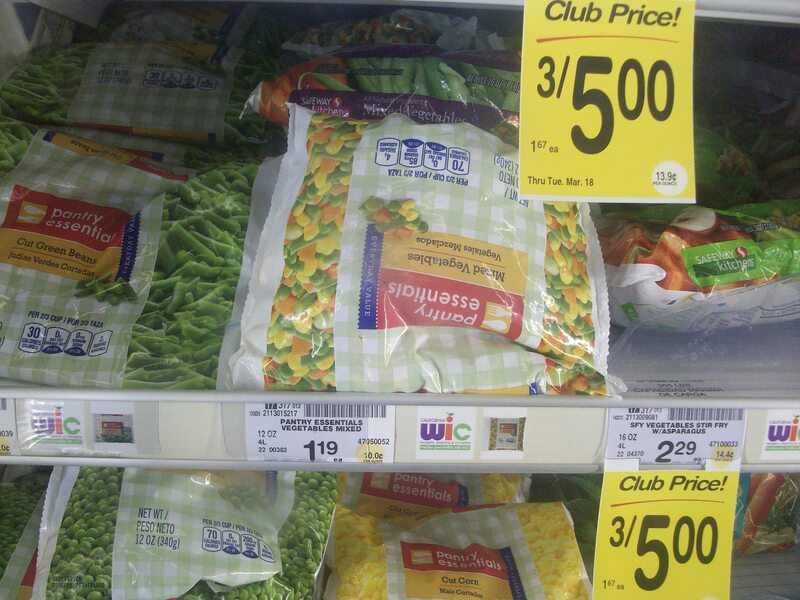 Despite the popular claim that fast food is so much cheaper than healthy food in the USA, I found a bag of mixed vegetables for 1.19$, whereas the frozen pizzas cost 3$. So even in the USA the Herbertz diet would be affordable. That’s my “don’t try this at home!” diet of replacing my usual dinner of pizza and fizzy drinks with vegetables and water, which allowed me to go from 94.4 kg (207 lbs) to 79.5 kg (175 lbs) over the course of a year. At 6:30 in the morning, an earthquake of magnitude 4.4 woke me up. A lot of people on my twitter feed commented about it. Woaaaa!!!!! Earrrrthquake !!! Now that was a HuGE jolt !!! I missed the opportunity, because I went back to bed. Hours later, I also mentioned it, before leaving Los Angeles. Originally my plan was to drive around the coast with a few stops and then to reach my hotel in Santa Clara in the evening. I picked Santa Clara, since it is 50 miles from San Francisco and other locations, which would allow me to take day trips. Also, hotel rates in San Francisco are more expensive than the ones in Santa Clara. However, I misjudged the distance to get there from Los Angeles a bit, so after driving along the coast for a while, I had to abandon that plan and head to the highway instead. If I were to do it again, I would split this one day trip up into two days and visit a few places along the way. On the way I noticed a bill board that advertised the in-N-out burger (check out Daym Drops’s review) 16 miles away. From all the different burger places (Johnny Rockets, KGB, Heart Attack Grill, in-N-out and probably some others that I forgot) we tried in Las Vegas last year, I liked that one the best, so I made sure to stop there. One of the odd things about driving in the USA is the way warning labels are arranged on the pavement. The argument is that you are speeding by and read a single word like “signal”. Then a bit further down the road, you see another word “ahead” and are supposed to combine it to “signal ahead”. However, anyone who isn’t a mole and has half way decent eyesight will see both words at once and read them from top to bottom as in a book. The notices then become “ahead signal”, “clear keep” or “xing ped” (pedestrian crossing). The highlight of the day was meeting up with my buddy Dr. Bob (not the one who appears on google image search) at the Fire Station. When I mentioned that I wanted to take a day trip to San Francisco, he suggested to take the Cal-train, which is as fast as going by car, but is cheaper and more convenient than driving and paying for parking. I followed Bob’s advice to take a day trip to San Francisco. The Cal-train is indeed pretty nice, but I should have boarded it at Sunnyvale, which is in a cheaper zone than the one I started from and it has more trains that stop there. 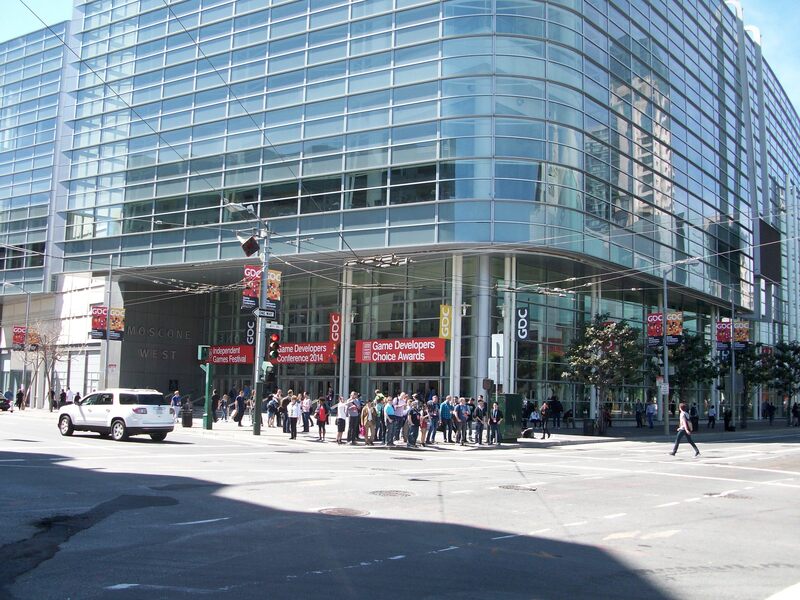 By accident I walked past the GDC in San Francisco. In the meantime, they’ve pulled Day‘s talk from the free to view section of their website, but Nika Harper‘s talk is still available as of writing this. I walked through China town, expecting it to be a few streets like in London. Instead, it was quite extensive. 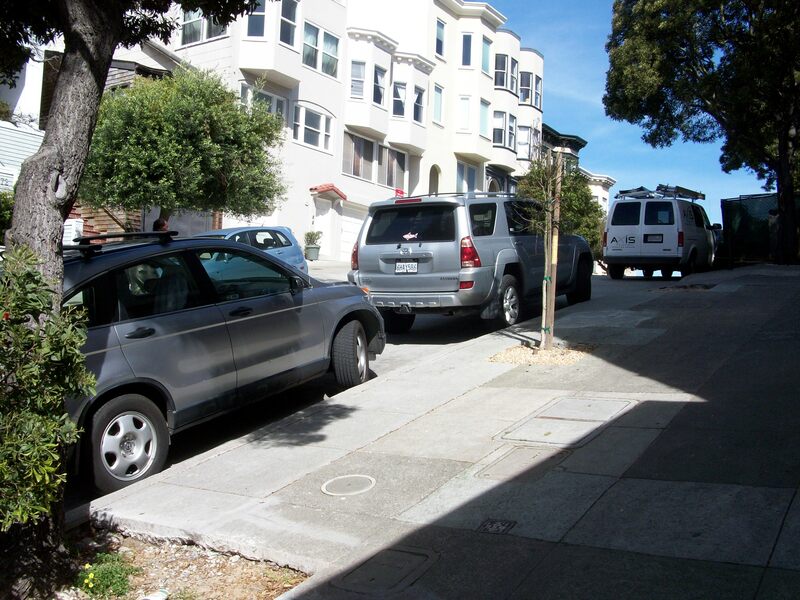 As you can see in the picture, people in San Francisco know that you are supposed to turn your tires when you’re parking at an incline. Eventually I reached Fisherman’s wharf, where I saw the sea lions. In the evening I met up with my friend Martha for dinner. The very next day she flew to London and met up with mutual friends. I told her that I had been eating a lot of Mexican food during that trip, but when she enquired about that, I had to admit that it was mostly Chipotle. That counts as Mexican from a European perspective, right? Although Bob suggested to see Alcatraz instead, I drove to Alameda on Thursday. 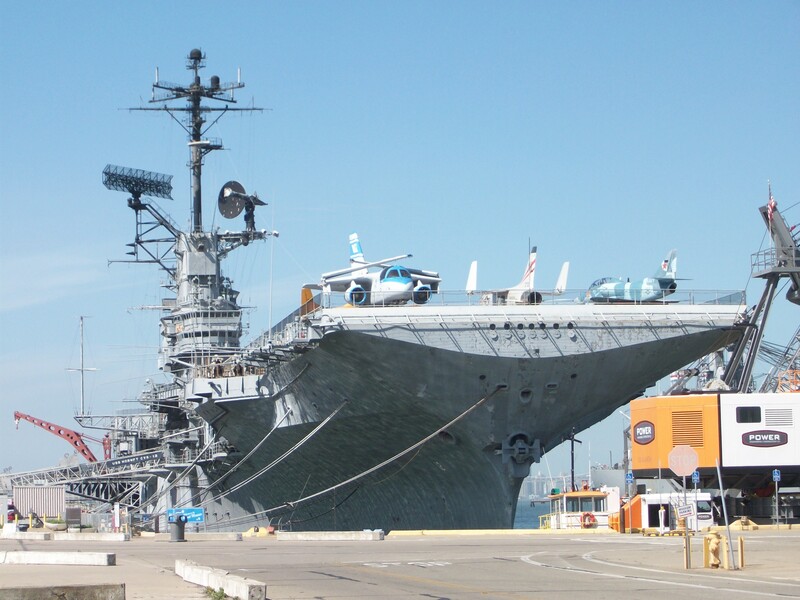 They have the decomissioned aircraft carrier Hornet there, which was turned into a museum. I certainly recommend seeing it, but it’s essential to go there after lunch. Apart from vending machine snacks, there’s nothing to eat on the ship and there is nothing near by either. There were two guided tours on the ship, which were included in the ticket price. First, I joined the one that showed the flight deck, the tower and the bridge. The second tour went down to the engine room and showed that the commands from the bridge would then be cross referenced on a chart to see how many RPM would correspond to a certain speed in knots. If the main bridge and the secondary bridge were gone, the procedure was to manually reset the rudder and then turn to one side by using only half of the engines. In addition to the tours, there were a few areas that one could freely visit. Since the Hornet was also the ship that welcomed the Apollo astronauts back, they put the mobile quarantine station on display, where the astronauts had to live for a few days until they were transferred to a bigger quarantine facility for a longer duration. 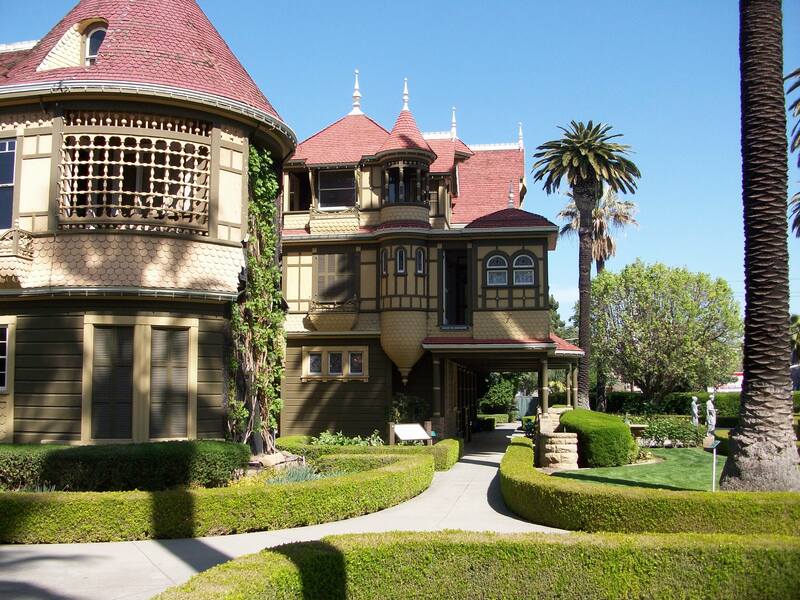 Before driving back to Los Angeles, I took the opportunity to visit the Winchester Mystery House. Unfortunately it was forbidden to take pictures inside, because some film studio reserved exclusive film rights, but they haven’t even started working on their movie. Wikipedia has a whole list of haunted sites across the world and apparently the Winchester Mystery house made it into the top 10. It’s certainly worth a visit, if you are in the area and have two hours to spare. Even though I did not manage to do so, I would recommend booking the tour for Friday the 13th when they do special flash light night events. Spooky! As mentioned, the highlight of the day and of the whole trip was the Day meeting with its separate blog entry. Unfortunately it was time to go. A bit more than one week is a nice duration in the sense that the 10+ hour flights are justified, but apparently it isn’t long enough for me to get homesick. I certainly could have stayed longer, but since I’ll be back twice more this year, it didn’t matter all that much. It’s strange that out of all the people, who were queuing up for the security check, I was the only one that opted out. They didn’t even have any regular gates anymore, so I was told to step through the Terrahertz scanner when it wasn’t turned on. The security person, who operated the scanner, was alarmed at that and asked around what was going on, so I mentioned that I was getting the pat down. In the waiting area after the security checkpoint, I waited in line to get a pizza. The start of the line wasn’t clearly marked, so everybody was confused. The dude next to me used that as a conversation starter and I found out that his name was Pierre and that he was going to Japan for a week. My advice for him and his buddy Sean was to memorize the few characters that they needed, like the one for the stop they want to get off of the train or the ones for the tuna mayo onigiri (there’s one that looks like a mirrored E and another one that looks like a smiley face…). Later on, as we were all waiting to collect our pizza, he complimented a girl about her leopard trousers. Her name was Britta and even though she’s American, she lived and worked in Munich, so she spoke both English and German without any foreign accent as far as I could tell. That was some serious channeling of Carly Rae Jepsen right there, but it actually worked! On the flight back, I only watched one movie (Red2, IMDB score 6.7). This time around I managed to get some sleep, so I wasn’t as jetlagged when I arrived back in Germany. 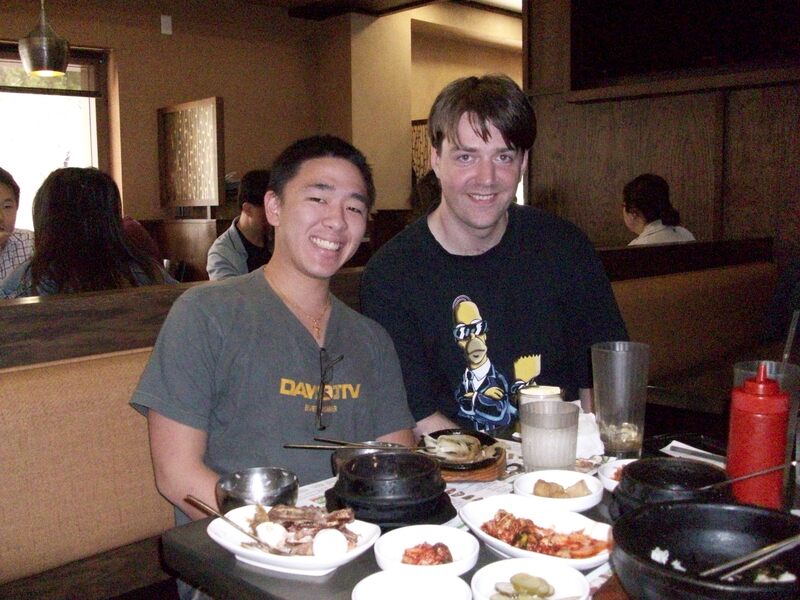 I just came back from the Day meetup at the Hae Jang Chon Korean BBQ. Repeating the ritual of the first meetup, we went to the dessert place Haus afterwards (thanks for the coffee and waffle, Sean!). Again, I did not manage to tell my story of how I almost got mugged in London or about that funny night out on my UK road trip in 2011, but since the conversation developed into other directions there wasn’t a good opportunity to share it. In general I’ve found once more that I am a lot better in one on one situations than I am in group conversations. For example, I met up with Michael, who organized the meetup (again, thanks for that! ), for lunch and we had a good time talking about anime, computer games, game design and other topics until we met up with Jeff and Melanie later on (EDIT: Where we also had a good time – but I was a lot quieter then, by contrast). However, at the BBQ I took myself back and faded into the background, mostly listening and only interjecting a comment here and there. From left to right (I apologize for any misspelled names): Travis, Heather, Kevin, Jimmy, Melanie, Michael (in front of Melanie), Sean, Brit (in front of Sean), Jeff, Jason, Evanne, Kai, Kevin, Chris, Ross. At the BBQ, Sean greeted me with “Good to see you again. How is the book going?” I was pleased that he remembered my novel, since I brought a copy for him. It’s still in the raw alpha stage, but I am convinced that with the feedback from my alpha (and later beta) readers, I can shape it into something worthwhile and entertaining. That said, I hope Sean and my other alpha readers do get some enjoyment out of the book in its current incarnation. Of course I’m still not ritzy enough to justify flying in for dinner and dessert, so I actually arrived in the USA a week ago and went on a little vacation. I’ll have a blog up with the highlights from that California trip, soon. Nonetheless, just like last time, this was the highlight of my vacation – it was really great to meet everyone (or meet again in case of one third of the attendees) and hopefully I’ll see you all some other time (MLG Annaheim, perhaps?). With a few exceptions, my schedule looks similar to last year’s. 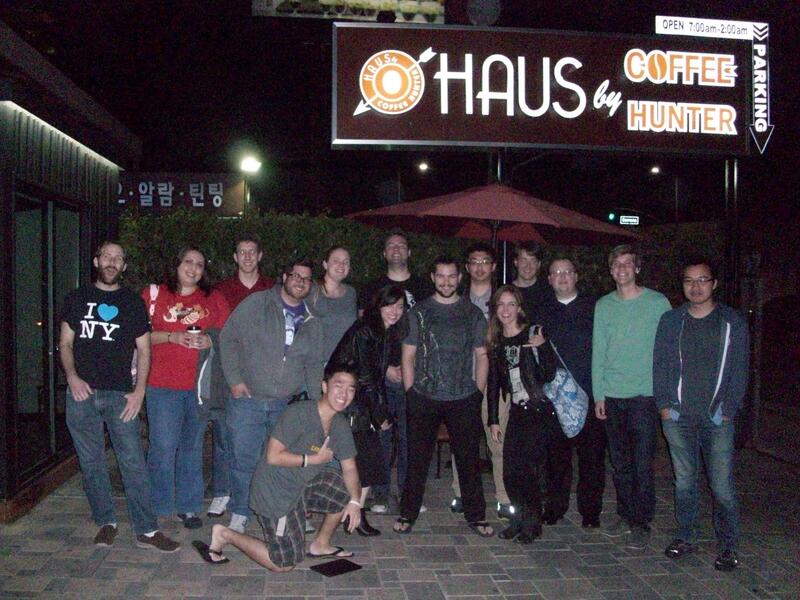 Next month I’m going to Los Angeles again to meet up with the Day community just like last May. However, on this trip I won’t be going to Las Vegas. Instead, I’ll get a rental car and drive to San Francisco and neighbouring cities. A trip to Las Vegas is still in the cards for May, when Lindsey Stirling, whom I’ve seen in June 2013, is performing there. Unfortunately these events are all spaced out, so I will be flying to the USA yet again in June for Vidcon. The dates of World Con and Gamescom collide. Since I had a good time at Gamescom last year, I’ll probably attend it this year as well. As usual, in October I will be at Spiel’14. These are the dates that are fixed at the moment. If there is anything cool going on that isn’t too far away and won’t use up too many days, let me know. One of my new year goals (I call them goals instead of resolutions, since resolutions carry that stigma of being broken within the first weeks of January) is to read twentyfour books this year, so I figured I might as well write some reviews and turn those into blog posts. Yesterday I finished reading Rachel Aaron’s “The Spirit Eater”, which is the third book of the Eli Monpress five part series. Synopsis: Eli Monpress, self proclaimed world’s greatest thief, and his team are lying low after their risky adventures in books one and two. Their rest is short lived, as one of Eli’s friends is in trouble and he sets out to help him. Just like in the previous two books, during their adventure, the spiritualist Miranda Lyonette is in hot pursuit. Review (spoilers! ): Eli Monpress’s third adventure deviates from the previous books: this time Eli doesn’t go somewhere to commit a crime and Miranda Lyonette doesn’t become the unlikely ally. Overall the book is much darker than the previous installments. It seems that Rachel Aaron found her stride with this book and it nicely sets up the antagonists for the remaining books. I can’t wait to find out how the three big threats – the shepherdess, the demons and the immortal empress – are overcome. My two favourite moments were the inspirational talk given to Nico by Tesset and how Dunelle died. The latter was sad, which is surprising considering the character in question only has a brief appearance and is an object. The Spirit Eater is an excellent, entertaining fantasy story that accomplishes the difficult task of being self contained, while also hinting at the rising stakes of the following books.